TWO SETTIGNG MODES- Premium CREE XP-G2 LED,Low light(3 lumens）and high light(130 lumens),3 in 1 tactical penlight,very unique and cool. USB RECHARGEABLE PENLIGHT- Connect the flashlight to any power supply, such as computer, laptop, phone charger, car charger, etc. CONVENIENT DESIGN - WUBEN LED penlight features tighten the head to turn on the light and it is easy to clip to the pocket for convenience. MINI POCKET SIZE - WUBEN LED penlight measures 6.06 inches in length with a body diameter of 0.54 inches.It's easy to carry to everywhere. 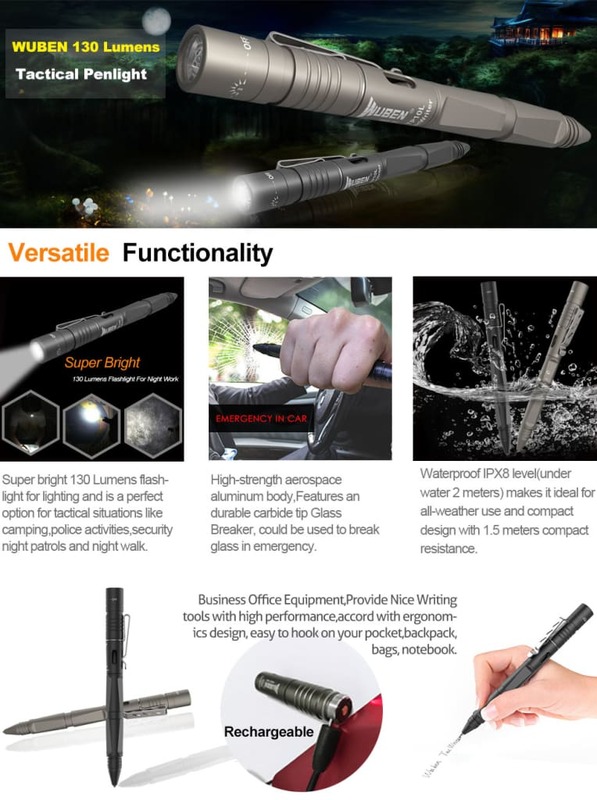 WATER RESISTANT DESIGN - High-strength aerospace aluminum body and Waterproof level IPX8, WUBEN LED penlight is a perfect option for tactical situations like camping, hunting, fishing, police activities,security night patrols and also for Business Office Equipment like writing Signature.